"A"'s parents and brother had gone back to Bangalore and it was only the two of us left on this majestic mountain range. 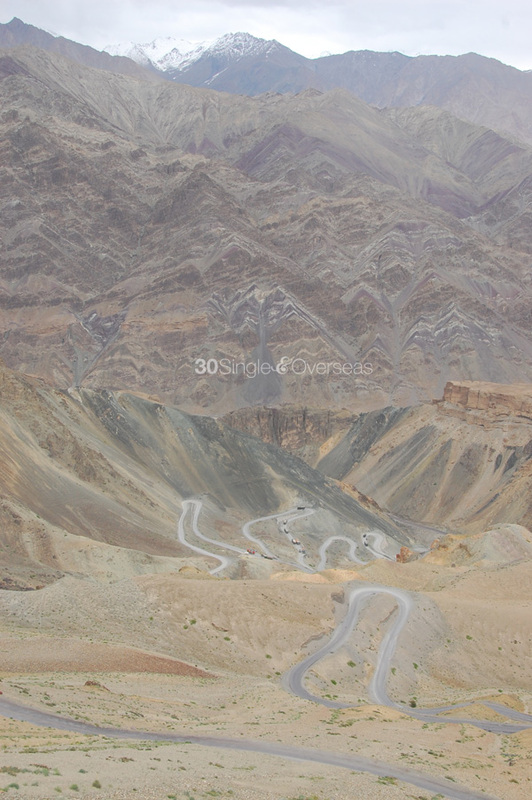 We spent a couple of days doing absolutely nothing in Leh except slowly inhaling the insufficient mountain oxygen and reading. 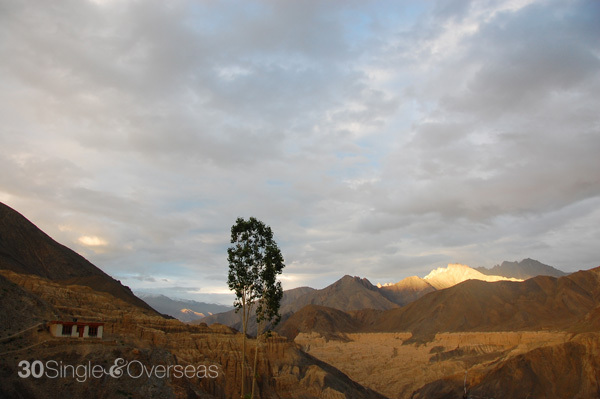 On our third day, we decided to go towards the West, to Lamayuru. 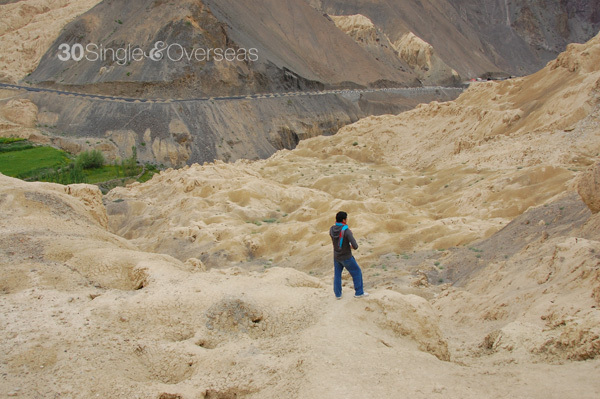 Lamayuru is about 125 km from Leh, 8 hours by car. Legend has it that this place was once the bottom of a deep lake but a Buddhist scholar prayed and caused the lake to drain. 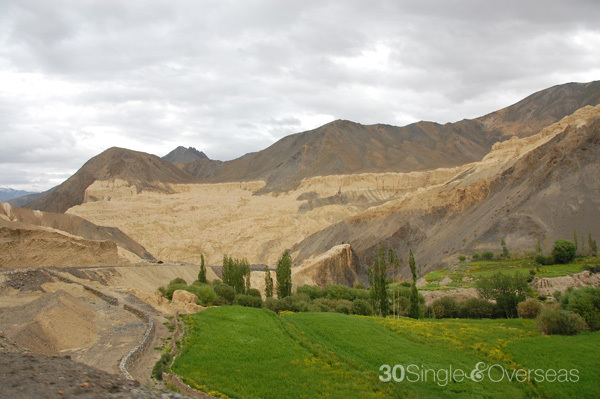 He then built a monastery here which housed the oldest gompa in Ladakh. Sounds like a fairy tale, but it's not all untrue. This place does look as if a lake has vanished and left a bizarre moonscape of rock formations. The legend carved in stone. The vanished lake and moonscape of Lamayuru. Trekking on the moonscape. It's just as you thought it'd be; the surface under our feet was like semi-solid sand cakes. I was so certain there was going to be a landslide or I would step into quicksand because occasionally, I'd come across a hole in the ground and when I'd peep into it, all I would see was darkness. Moonscape up close. 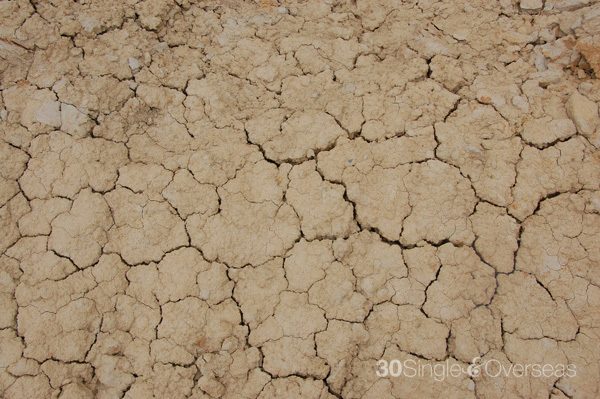 Looks like a dried-up mixture of powdered sand and mud. 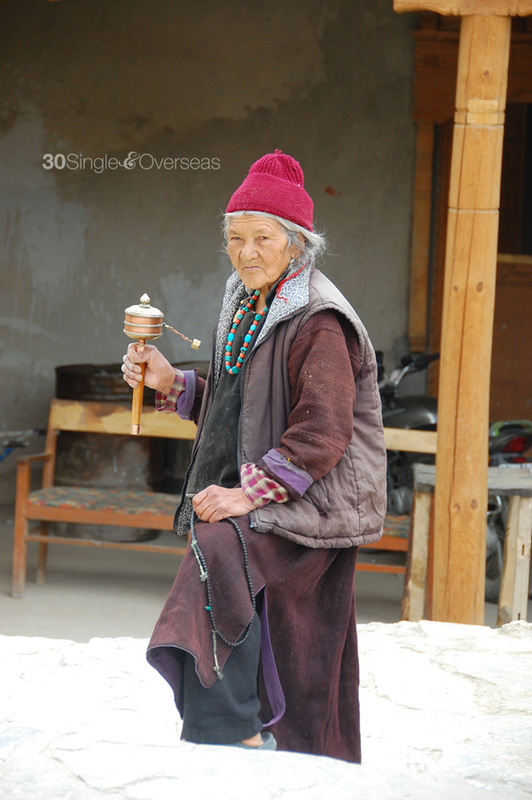 An elderly lady who was hanging out at the monastery busily spinning a prayer wheel. 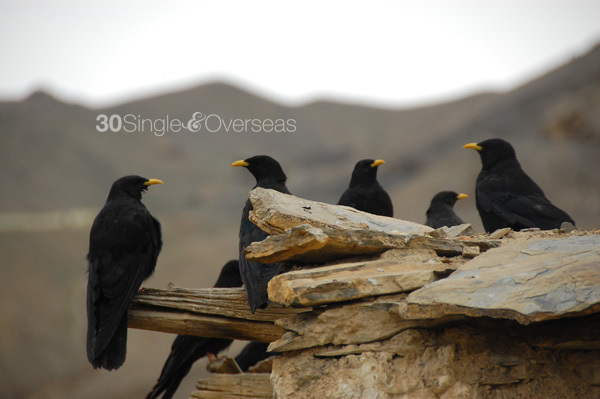 Blackbirds chilling out on the top of the ancient gompa. "A" exploring the moonscape caves. 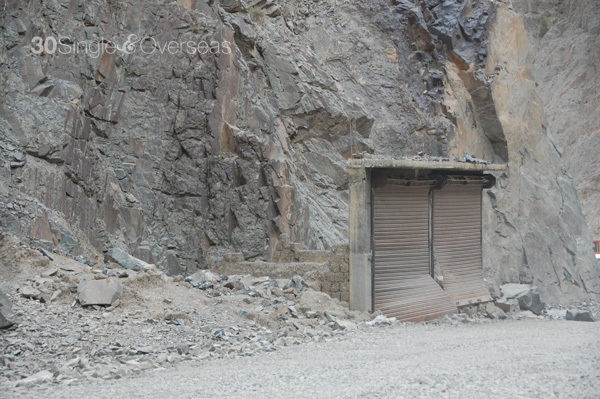 Some of these caves are manmade and are homes to the locals. 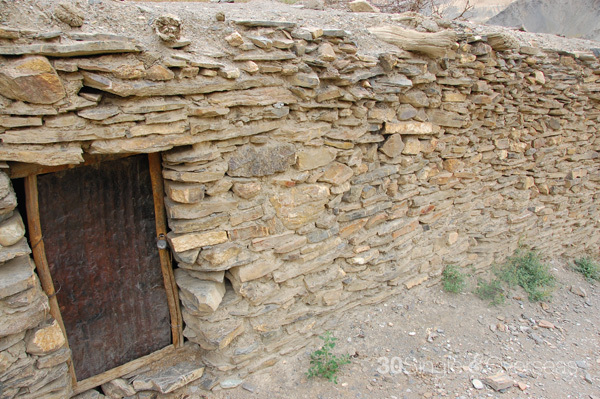 A tiny door to a sturdy home. Doors that lead to no where. The many colors of the Himalaya. The scary yet amazing view on our drive. 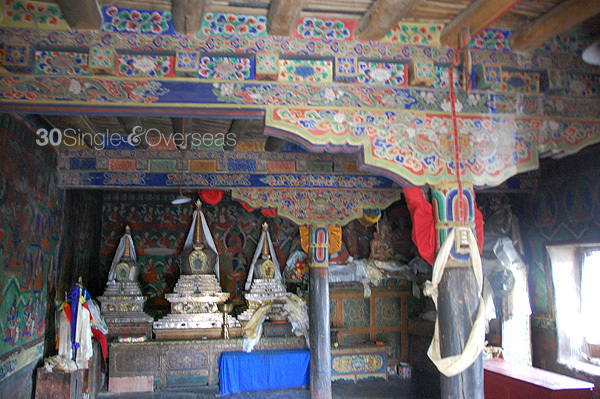 Apart from trekking, you could also do some stone-carving at the "shop" attached to the monastery's guesthouse. 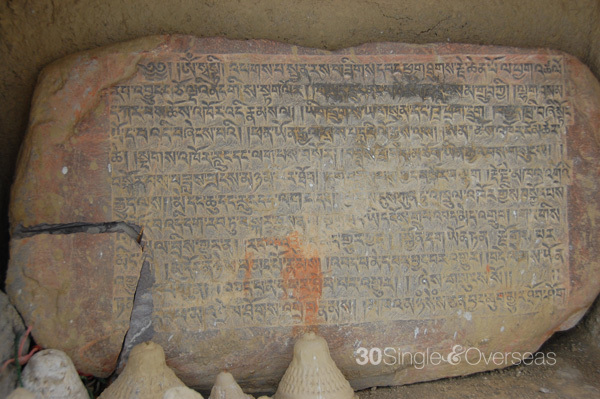 "A" had the great idea of carving our names in Tibetan, on a slab of stone, but that stone remains unfinished to this day and is now collecting dust somewhere in my closet. There were some curious young monks around. There are not too many choices for accommodation. We stayed at the guesthouse run by the monastery that has basic amenities, hot water and pretty good food. We requested the room that's on the terrace and our view was simply amazing. "A" doing the moonwalk in front of the moonscape. Click here for more pictures of Lamayuru.